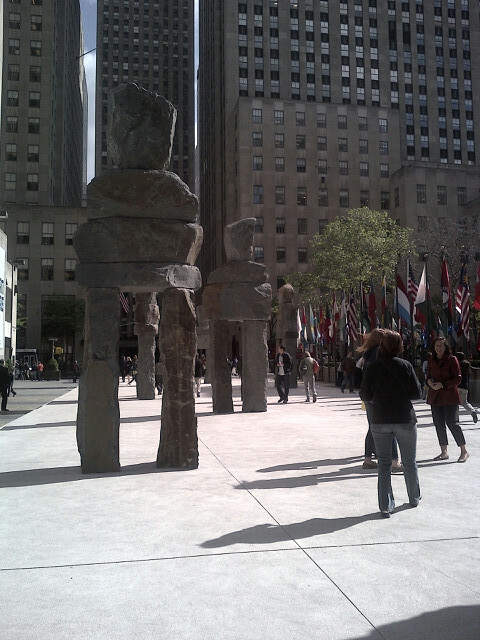 Ugo Rondinone’s very ambitious installation grapples with monumentality; the original smaller versions made from the rocks surrounding his Northern Pennsylvania home have grown into to the larger-than-life figures displayed at Rockefeller Plaza. The installation Human Nature – according to the public art fund – consisted of figures ranging about sixteen to twenty feet in height and weighing up to 30,000 lbs. each. On Friday, May 10th during Frieze Week, I attended a private breakfast with Tracey Emin, Jay Jopling, and a host of curators and collectors to celebrate Roman Standard’s opening. This very subtle piece, a tiny bronze bird perched on a thirteen foot pole, inventively brings together the legacy of ancient Roman military sculptures and contemporary issues of perception. It was amazing to see how an artist like Ugo, who started out using the materials from his local surroundings as a means of intuitively investigating his environment, could create such a determined work that is magnanimous and conceptual at once.